When HYDRA’s infiltration of S.H.I.E.L.D. was revealed in Captain America: The Winter Soldier, it obviously had enormous repercussions in Agents of S.H.I.E.L.D. Season 1. The once-powerful organization lost the majority of its resources and more. It also took several agents out of the equation, but one of those agents now looks to finally be returning after a two-season absence: Felix Blake. 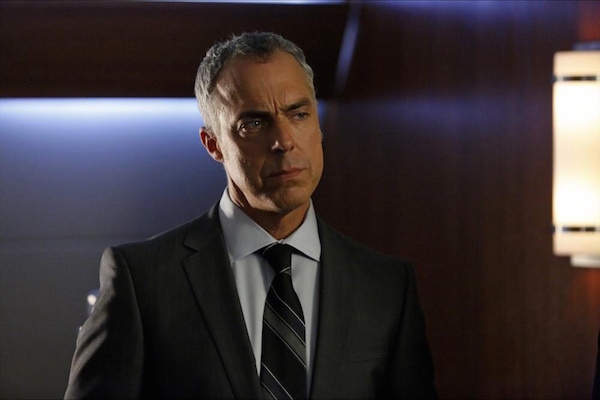 Last seen in "End of the Beginning," it has been revealed that actor Titus Welliver is reprising Blake for Season 3’s fourteenth episode, titled "Watchdogs." ABC didn’t provide any details about the circumstances of his return, but considering he was worse for wear the last time he was on the show, it will be good to finally learn what happened to him. Welliver debuted as Felix Blake in the Marvel Cinematic Universe in the "One-Shot" short film Item 47, where Blake tracked a couple who had gotten ahold of one of the Chitauri’s weapons following The Avengers. His first Agents of S.H.I.E.L.D. appearance was in "BZZT," where he clashed with Coulson over how he handled that episode’s mission. Blake returned in the "End of the Beginning," but was badly injured in a confrontation with Deathlok. He went into a coma shortly before the HYDRA uprising, and while viewers never learned where his true loyalties laid, the main characters later learned that Blake suspected HYDRA had infiltrated S.H.I.E.L.D., and he believed Coulson and his team were traitors due to their disrespect for authority. Still, better late than never, we should find out whether Blake was truly a good guy or also a deep-cover bad guy. When a radical group called The Watchdogs emerges with plans to eliminate the Inhumans, Agent Mack and his brother become caught in the crossfire. Meanwhile, Simmons discovers a powerful chemical compound that could alter the future for Inhumans. The Watchdogs were introduced to the Marvel comics universe as a right-wing terrorist organization set on restoring "traditional" America values, thus targeting anyone not sharing their "moral" outlook. They were originally under the leadership of the Red Skull, but more recently they took orders from William Burnside, a.k.a. the 1950s Captain America. Perhaps Blake has previous experience dealing with the MCU’s Watchdogs, and that’s why he’s called back into service. As for this powerful chemical compound, some possibilities could be that it either halts an Inhuman’s ability from awakening even after they’re exposed to Terrigen or it specifically targets people with Inhuman DNA for immediate incapacitation, or worse, death. Agents of S.H.I.E.L.D.’s "Watchdogs" will air Tuesday, March 29. Cat new episodes on ABC on Tuesdays at 9 p.m. ET.